Tikrit lies on the strategic Baghdad-Mosul highway, halfway between the two cities. The city is the provincial capital of Salaheddin, the second provincial capital to fall in two days after Mosul, which is the capital of Nineveh, deepening the crisis in Iraq. AFP, quoting a police officer, reports that the militants had freed 300 inmates from a prison in the city. Yesterday, ISIL freed more than thousands of prisoners in Mosul. In Mosul, ISIL looted 500 billion dinars ($429 million) from city's branch of Iraqi Central Bank, making it one of the world’s richest terrorist groups. Meanwhile, ISIL fighters today attacked the city of Kirkuk, home to Iraq’s biggest oil refinery. Also in Samarra, south of Tikrit, witnesses told AFP that that fighters had arrived in trucks mounted with machine guns. Never before has the situation been as dire as it is now. The entire Iraqi government is in peril. A similar scenario played out back in 2008, but Al-Qaeda was succesfully stopped and driven away with the help of significant assistance from US troops. The future of Iraq hangs in the balance. Ratio of terrorists to army men was 1 to 15. When they were attached they drop their guns and run away. What a brave army!!!!!!!! 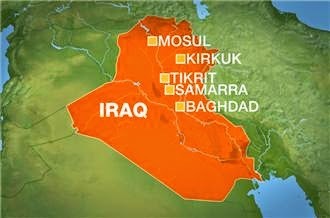 as farsnews reported tikrit is in hand of iraq armee ? https://www.youtube.com/watch?v=ZobkiFNpOSQ --- State Departement: ISIL in Iraq and Syria "Entirely different situations".